Day 1: Port Blair: Arrive in Port Blair and check into a hotel or resort. After some relaxation, embark on a trip to Corbyn’s Cove Beach, one of the most splendid beaches in Port Blair. The beach, situated some seven kilometer from Port Blair, is perfect for those who love swimming and sun-basking. 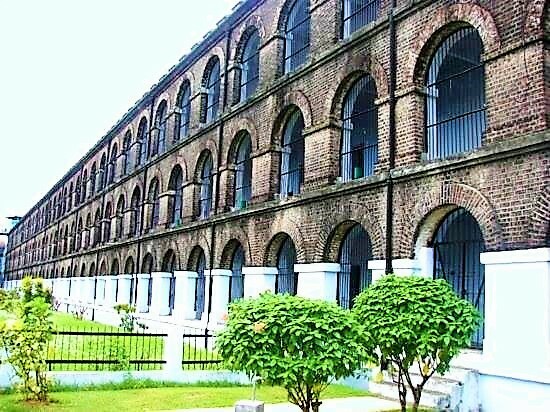 After an exhilarating experience at the beach, head off to the historic Cellular Jail. Enjoy the gripping light and sound show at the Jail, the place where Indian freedom fighters were imprisoned and tortured by the British. Return to the hotel, and have dinner. Overnight in Port Blair. Day 2: Port Blair – Ross Island – Port Blair: After breakfast, transfer to Marina jetty to catch boat to Ross Island, the erstwhile capital of Andaman Islands during the British period. Ross Island, situated two kilometer east of Port Blair, has picturesque views. The Island has ruins of some of the buildings that were built during British period – something which can bring nostalgic feelings in you. These ruins include British Church, Chief Commissioner’s House, bakery, market, swimming pool among several others. From Ross Island, move on to North Bay, a perfect place to see coral reefs, and enjoy snorkeling and scuba diving. For those who fear diving and snorkeling can enjoy looking at varieties of marine life through glass bottom ride. From North Bay continue in the same boat to explore Viper Island. The Island is home to the gallows, atop a hillock, where many prisoners, mostly freedom fighters, were hanged to death by the British. Return to Port Blair after a trip to the three islands. Have a delicious dinner at the hotel. Overnight in Port Blair. Day 3: Port Blair: After breakfast, embark on a city tour of Port Blair. Start with Naval Marine Museum, also called Samudrika. This gives a good information about the historical perspective of coral marine life, shells, geography and archaeology of the Andaman and Nicobar islands. Also visit Forest Museum, which offers an insight into forest activities through scale models and displays decorative pieces made of famous woods. Anthropological Museum displays tribal essential and artifacts. Make it a point to visit Chatham Saw Mill, which is one of the oldest and largest wood mills in Asia. You can have a look at some of the rare species of endemic birds and animals found on these islands at Mini Zoo. Have lunch at one of the restaurants or at your hotel. Towards afternoon, head to Wandoor Beach – one of the best beaches in Port Blair. You can experience a stunning view of the sunset. Return to the hotel, have dinner and retire to your room. Overnight in Port Blair. Day 4: Port Blair – Havelock Island: Check out from the hotel in Port Blair and take an inter-island ferry to Havelock Island, situated 57 km north east of Port Blair. It takes more than 1.5 hours to reach Havelock Island, the largest of the islands that comprise Ritchie’s Archipelago, which lies to the east of Great Andaman. Check into a resort on arrival in Havelock Island. Relax for some time at the hotel. Have lunch at the hotel and set off to enjoy the beauty of Havelock Island, which is home to five villages. Enjoy your afternoon at the world famous Beach No. 7, better known as Radhanagar Beach. It was declared as Asia’s best beach in 2004 by Times magazine. Return to the hotel. Have dinner at your hotel. Overnight at the hotel. Day 5: Havelock Island – Neil Island: Go for an early morning visit to Elephant Beach, which can be reached by a trek of around half an hour trough the forest. You can enjoy scuba diving and snorkeling at the beach. Scuba diving courses are also available at the beach. You can also enjoy sea walking at Elephant Beach. You can also pay a visit to Kala Patthar Beach, though it is a little far. There are other beaches in Havelock as well. Return to the hotel, have an early lunch and check out from the hotel. Transfer to the jetty to catch the ferry to Neil Island. Check into an accommodation at Neil Island. Rest of the day at leisure; enjoy on the beaches whose names have been inspired from Ramayan characters. The beaches are called Bharatpur, Lakshmanpur, Sitapur, and Ramnagar. Have dinner at your hotel. Overnight on Neil Island. Day 6: Neil Island – Port Blair: Get up early and head to the beach on the Neil Island. Take a walk on the island. This is a small island and you can walk across the whole island. Do some swimming if you want to. Return to the hotel and have a nice sumptuous breakfast. Check out in time to take ferry to Port Blair. Check into a hotel on arrival. Take a walk in the local market in the evening. Have dinner at one of the restaurants. Overnight in Port Blair. Day 7: Port Blair – Bartang Island – Port Blair: Begin very early (around 4am) in the morning for a full day trip to Bartang Island, famous for its limestone caves and mangrove forests. The journey to Bartang Island is in three phases. The first phase is the drive from Port Blair to Jirkatang (40km, around 1.5hours) and then from Jirkatang to Nilambur Jetty (49km, around 1.5 hours). The third phase is from Nilambur Jetty to Bartang Island (15 minutes by ferry). The drive from Jirkatang to Nilambur Jetty is always in a convoy lead by a bus with forest police officials. No overtaking is allowed on this route as this passes through the Jarawa Tribal Reserve. You may see people of the Jarawa Tribe while passing through the tribal reserve. From the jetty on Bartang Island you will have to trek through dense forest to reach the limestone caves. Enjoy the beautiful cave formations. Return the same way. Have dinner and retire to your room. Overnight in Port Blair. Day 8: Port Blair – Onward destination: After breakfast check out from the hotel and transfer to the airport to catch flight to your onward destination. Port Blair is connected by direct flights to New Delhi, Kolkata, Chennai and Bhubaneswar.